Human-centred design strategies, open licences and practices, and distributed online networks in design learning and research in higher education. And so, as with any other paper at university, I have to complete assignments. This page is one of my assignments for the paper, and the brief was to select a topic relating to open networks in formal and informal learning and write a blog entry on it, to be followed by a 20 minute presentation on my chosen topic in class. I have chosen to discuss data visualisation networks, better know as infographic networks. The most famous of which, and where I will start from, Information Is Beautiful. Information is Beautiful was founded by David McCandless, and is entirely funded by sales from books, posters and images. The website itself and the infographics are created and researched by David and his team. Although he clearly states he has this team supporting him, I could not find anything about who they were, or what exact roles they play in Information is Beautiful. Maybe they enjoy the anonymity? Having started his career as a writer for cult video game magazines, Your Sinclair and PC Zone, in the late 1980s to 1990s; before moving to The Guardian and Wired Magazine. 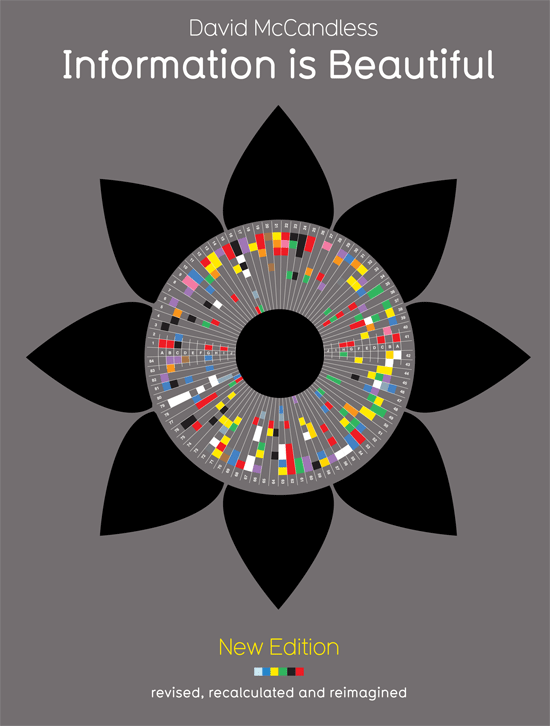 Since the publication in 2009 of the first edition of Information is Beautiful his work has been published by his old employers, and he has been showcased in MoMA, The Wellcome Trust gallery and Tate Britain. distilling the world’s data, information and knowledge into beautiful, interesting and, above all, useful visualisations, infographics and diagrams. While macabre, is revealing and informative. Humans kill more other humans than animals, cancer, and health complications combined. The website itself features a blog, where the latest visualisations are uploaded with descriptions and explanations. The store, where prints and posters can be purchased. The books page displays the nine different language covers and links to buy them from. Information is Beautiful also has its own twitter, facebook page, pinterest and newsletter. What I feel makes it really stand apart as an informal network leader though, is that in 2012 they started the first Kantar Information is Beautiful Awards, which are accepting submissions for this year right now! The competition is open to everyone, and has quite a few categories and prizes. There is a small fee for entering, but its incredibly reasonable; especially for student and individual entries (USD$10 students, USD$20 individuals). I only wish I had something worth entering; but alas, I haven’t had a communication or design visualisation project resulting in an infographic in over a year! Another thing to note is the creative commons licence used by Information is Beautiful, they went with a CC BY-NC. In laymen’s terms means that anyone can use their work in a noncommercial setting, as long they are correctly attributed. Which is why their infographics can be found allover the internet and, they are easy to share, just say where they are from and who made them. Perfectly easy for the majority of internet users. Now, this leads us to Visually. Visually is an infographics network, in that it is an online community which brings together data visualisers with commissioners (anyone who has a story to tell with data). So what are they about? Heres a short video they made to explain that to us. Visually lets members commission more that just infographics. I particularly like, how without being a member of Visually, you can still browse through the existing infographics and see what people have created, commission and non-commission. If you have a closer look at someones work there’s even a helpful button that allows you to ‘Start a project with this designer’. If you do in fact want to commission a project at Visually this involves you going through their marketplace, where it becomes apparent that you will have to pay good money, with infographics starting at USD$999 as the cheapest project outcome. So it means that as a member of the network you will actually get paid for any work you are commissioned for! As a designer, one of the worst problems is people thinking you will work for free because they do not understand what you do as actually work, is a huge step in the right direction! Most freelancers struggle to get clients who have agreed to pay them to cough up the money, theres even a website almost exclusively dedicated to their plight! So, overall I am very impressed and excited by Visually and what it will bring us as a network in the future! Which brings me to Piktochart. 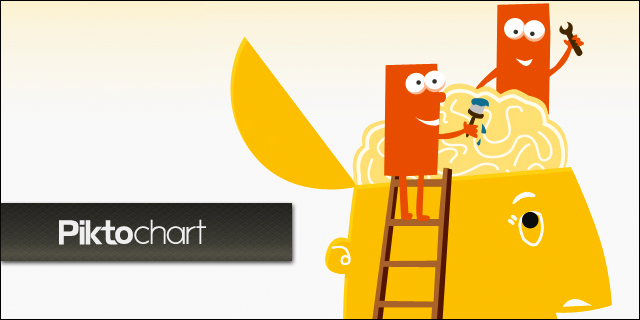 Piktochart helps you to create infographics, share and get results in 3 easy steps. They really do mean 3 easy steps. Piktochart lets you log in with a google account, or make a separate account with another email address, and choose from hundreds of ready made themes (templates) to make an infographic. That’s it. You simply drag, drop, and fill in the blanks. Reminds me of late 1990s to early 2000s Microsoft Desktop Publisher templates, except that Piktochart has thankfully moved beyond clipart, confusing printing instructions, unavailable fonts, and hard to rearrange features. Piktochart is free, but they have also just launched a pro version. The pro versions provide access to more themes, icons, the ability to export to HTML files or images, more image uploads, and the piktochart watermark will not appear on your projects. The pro version is also available for education at a discounted rate. Not bad at all. This can be attributed to their simple process. Or it could be that they have just realised that the majority of established companies are reluctant to spend their budgets on communication designers, and would rather pay a inconsequential one off fee that allows an untrained staff member to create something effective in a short space of time. I will most likely never find out. Piktochart employers designers though, and that I do approve of. They have a team whose average age is 26 and are still looking at increasing their already large team. Their work is good too. My only real grumble is that the people who go to use Piktochart seem to learn nothing about what constitutes effective communication design, apart from Piktochart makes things look nice for them. This is a personal thing however, and I do respect what the team at Piktochart are doing, bringing clear, effective communication to a market that just doesn’t usually understand it or want it. Let’s try and communicate a bit better, we might learn something. This is a good overview of three very different infographic sites. Useful links, too. David McCandless and the Information is Beautiful team have certainly helped to put graphic visualisations of data on the map!